QUEENSLAND police are urging road users to be cautious on the roads in the new year following another year of fatal crashes. 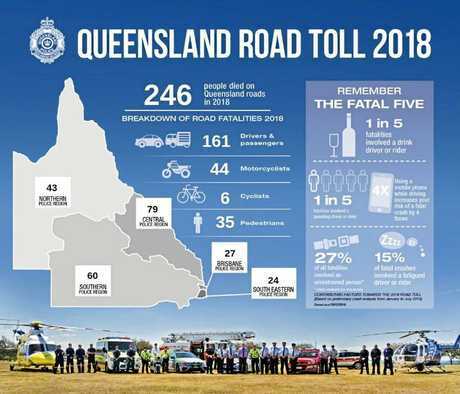 This comes after two more lives were lost on the last day of the year, bringing the Queensland fatal road toll to 246 lives over 2018, compared to 248 in 2017. There were 60 lives lost in the Southern policing region last year, which includes the South and North Burnett. Burnett emergency services saw their share of a dozen fatal traffic crashes throughout 2018. This week marks a year since a double fatality on the Bunya Highway on January 2, 2018. A 27-year-old male driver and seven-year-old boy died at the scene near the Kilcoy Murgon Rd intersection at around 4.55pm, when a semi-trailer towing a tri-axle trailer smashed into a white dual cab ute. Murgon rugby league coach Andrew Cole, 34, was killed in a high speed head-on collision on the Burnett Highway near Booubyjan, on March 17, 2018. 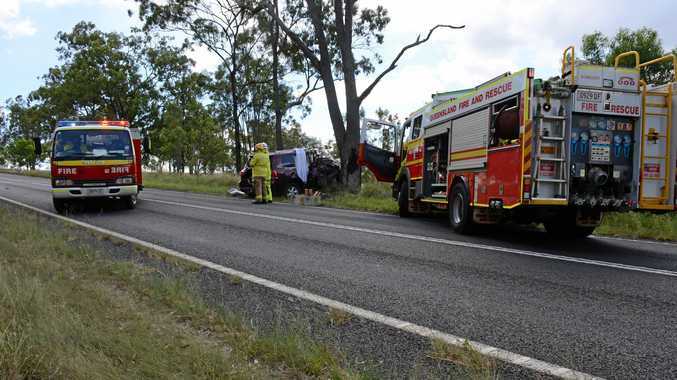 The following month a 64-year-old Bungadoo woman later died from her injuries after a single-vehicle crash on the Bunya Highway. The woman's sedan was heading north on the highway before leaving the road and striking a tree 9km south of Kumbia in the South Burnett at around 11.30am on April 3. Later in the year, Nanango teenager Lochlan Cresswell died in a car crash on the D'Aguilar Highway between Kingaroy and Nanango on October 1, the day after his 19th birthday. A 49-year-old Durong man drove through a wire fence at 6.21pm on Ironbark Rd on December 12. QPS reported the man had died as a result of a medical condition. In the North Burnett, a 66-year-old motorcyclist was killed in Degilbo near Mount Perry-Gayndah Rd on January 28 last year. The following month a 25-year-old Biloela man was killed in a crash at Moonford. The male driver was killed at the scene of the single vehicle-crash on the Burnett Highway on February 23. Tributes flowed for Bundaberg man Rhys Latham, 23, who was killed in a crash after his 4WD collided with a truck on the Burnett Highway, 8km north of Tansey on May 28, 2018. A 43-year-old Sunshine Coast man was also killed in a single-vehicle crash on the Burnett Highway near Monto on September 2. A QPS spokesman said it was determined the accident was the result of a medical incident. Samantha Mcleod, 37, died in hospital on October 15 after sustaining serious injuries in a single vehicle crash outside Gayndah. Emergency services had extracted the Gayndah woman from her vehicle which was located in bushland off Gayndah Mundubbera Rd on September 30. A man in his 60s was killed when the van he was driving hit a tree on the Burnett Highway near Booubyjan on December 30. His female passenger was transported to hospital with life threatening injuries from the crash, which occurred between Tansey and Ban Ban Springs at around 1.44pm. Throughout 2018, there were 161 drivers and passengers killed on Queensland roads, 44 motorcyclists, six cyclists and 35 pedestrians. A Queensland Police Service spokesperson said motorists should remember the Fatal Five. "Remember, the only way to get onto the 'Fatal Five' list is to be driving in a behaviour that is known to kill," they said. One in five fatalities involved a drink driver or rider, whereas being distracted by using mobile phones while driving increased the risk of a crash by four times. A speeding driver or rider was involved in one fifth of reported fatalities and 27 per cent of all fatalities involved a person who failed to wear a seatbelt properly. Fatigue continue to also be a killer, with around 15 per cent of fatal crashes involving a fatigued driver or rider. Police officers started the new year by continuing to target high risk road users. They charged a total of 61 drivers with drink driving and 78 drivers returned positive roadside drug tests across the state on the last day of the year. Police reported 29 people were injured across the state in traffic crashes and more than 2800 speeding motorists were detected on December 31.